I’ve got a fun new gig to tell you about! I’m going to be a weekly contributing commentator for Life & Style magazine. I’ve been asked to comment on the biggest celeb fashion oops of the week for the gossip mag. I absolutely love fashion and can really appreciate red carpet risk taking, so this might be a bit of challenge for me to be snarky when it comes to style, but I’m up for the challenge. And judging from the first round of pics, it won’t be all that hard. The jokes just came pouring out. It’s a fun, playful, creative new outlet for me. No harm no foul, its just comedy! I hope you all appreciate my sense of humor! 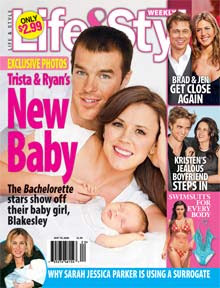 Pick up next weeks issue of Life & Style to check it out (not this one with Trista and Ryan). Before I go, feel free to comment on my couture. successful night. Talk soon party peeps!